Primary muscles recruited in skiing are categorized into 5 groups. First in the chain of command, the feet and ankle muscles are essential in dictating movements of skiing. All lower-body actions in alpine skiing originate with the ankles and feet. Consider all of the subtle motions employed by the feet. Ankle inversion and eversion muscles transfer pressure to the inner and outer edges of the foot, maintaining lateral and medial alignment. These include the calf muscles, the peroneals on the lateral edge of the lower leg, and tibialis anterior, running directly parallel and lateral to the shin bone; all hot-spots for massaging the tired skier leg. These muscles also engage during dorsifelxion and plantarflexion, or pulling up and pushing down the ball of the foot in the ski boot, constant actions in skiing, as we maintain fore/aft balance and support ourselves on uneven terrain. The quadriceps and hip flexors, or frontal thigh muscles, act together to flex the femur toward the pelvis, ie. pull the knee upward, stabilizing us in a squatting position, such as that employed skiing. The vastus lateralis is the sole muscle of the outer thigh, and its fascia will often adhere to the iliotibial tract (IT band), a superficial sheet of strong fascia with vertical fibers that run up the lateral side of the thigh. This lateral edge of the thigh is a common target area for skiers’ massage, as it constantly stabilizes the hip and knee. Another distinct group of skiing muscles is the hamstring group, which opposes the action of the quads, extending the hip and, most importantly in skiing, flexing, or bending, the knee. Composed of three muscles, smaller than the quadriceps group, they all originate from the ischial tuberosity, or sit-bone, and help absorb shock and protect the ACL. Further up the chain are the hard-working gluteal muscles. Primary drivers of the hip joint, they are called to action with every bump and turn we take. We feel the work more in the thigh and leg muscles, when in fact the gluteals bear much of the impact, laterally and medially rotating, flexing, extending, adducting and abducting the hip joint/femur. The gluts are engaged with every lower body biomechanical motion in skiing, and resist the powerful forces put on the body gravitationally. Perhaps least obvious, the core and torso musculature, provide dynamic balance and structural support. The deep core muscles stabilize the lower back while skiers take on varied terrain. The quadratus lumborum, or QL, is a common culprit in lower back pain, as it deeply connects the top of the posterior pelvis to the lowest rib and lumbar vertebrae, stabilizing, flexing and shock-absorbing the impact of the bumps of skiing, yet never noticeably tiring, just tightening. Similarly, the deep and tireless psoas, primary hip flexor and core muscle, contracts and stabilizes, and contributes to lower back pain and tight pelvic and gluteal muscles. The erector spinae group are torso muscles which run up the sides of the spine from the sacrum to the neck, laterally flexing, or bending, the spine, as well as bilaterally extending the spine and torso; keeping us upright. An additional group to acknowledge is the shoulders and arms. 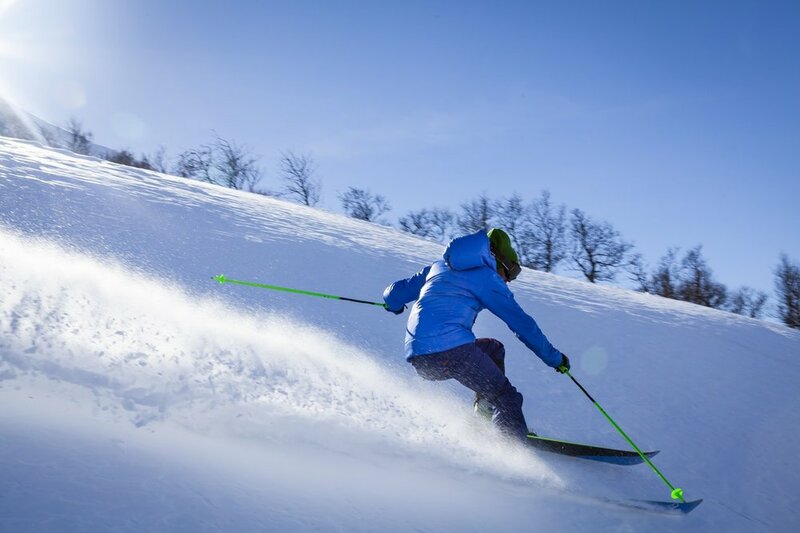 The biceps, triceps, deltoids and rotator cuff muscles all fire when using ski poles, and we especially feel their work at the beginning of the season. High quality educated massage work, customized for the individual skier, alleviates the tight fatigued musculature from a day on the slopes. Soothing gliding and kneading techniques, combined with hot stones to relax tense muscles and promote circulation, and targeted manipulation of specific areas, including cross-fiber friction, trigger point work, vibration, jostling and passive stretches, will generally loosen and renew your body for another day of fun on the mountain. For further information or to schedule a massage appointment please contact Alessandra Jacobson at Alison Palmer Physical Therapy and Wellness Center, (970) 729-1737. We are located in the Cimarron Lodge at the bottom of lift 7. Wellness is the full integration of mind, body and spirit.